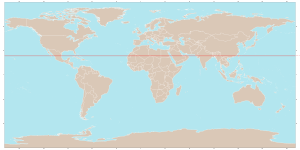 The Tropic of Cancer (cancer (♋) is Latin for crab) is one of the five major circles of latitude (imaginary lines around the Earth) that are often marked on maps of the Earth. This is the parallel of latitude that is 23° 26' 22" north of the Equator. At every June Solstice the Sun passes straight overhead on the tropic. This never happens anywhere north of the Tropic of Cancer. This page was last changed on 19 August 2017, at 02:35.